Image: prepared by Gary Lai for his presentation at the Net Zero Conference. Water conservation is an ongoing topic of discussion and exploration here at AHBE. From simple water-saving tips to broader statewide drought-related issues, our staff and AHBE Lab contributors have advocated for smart water habits and policies. Net Zero Water is the next step for water conservation supporters and serves as a concept and framework for water self-sufficiency. Simply put, Net Zero Water practices could help us achieve independence from the water grid and get all the water we use from nature and treated greywater. In Southern California, achieving Net Zero Water is very difficult unless you have a huge parcel of land with a tiny house. A building-by-building solution is impractical. A household would have to implement the equivalent of a wastewater treatment plant in its garage, which is not economical for most people. Water independence through Net Zero Water strategies is possible for Californians if we think about them in terms of a collective achievement at the neighborhood, city, or county level. I have become fascinated with the thousands of man-made lakes we built in our state in the 1980’s and 1990’s. Although they are lovely private and public amenities, these lakes were being supplied by millions of gallons of expensive imported water from the Owens Valley and Northern Sierra Nevada. At one point, the make-up water from private man-made lakes ranked number one for water usage in our state. Consider the impact on our water supply if the lakes were taken off the grid and used instead to supply treated drinking water to a whole community or eco-district. Graphic by Los Angeles County Dept. of Public Works for Magic Johnson Park Phase 1A project. I am currently working on a project in the South Los Angeles area. The project calls for improvements to an existing park called Earvin “Magic” Johnson Park which serves LA’s Willowbrook community. 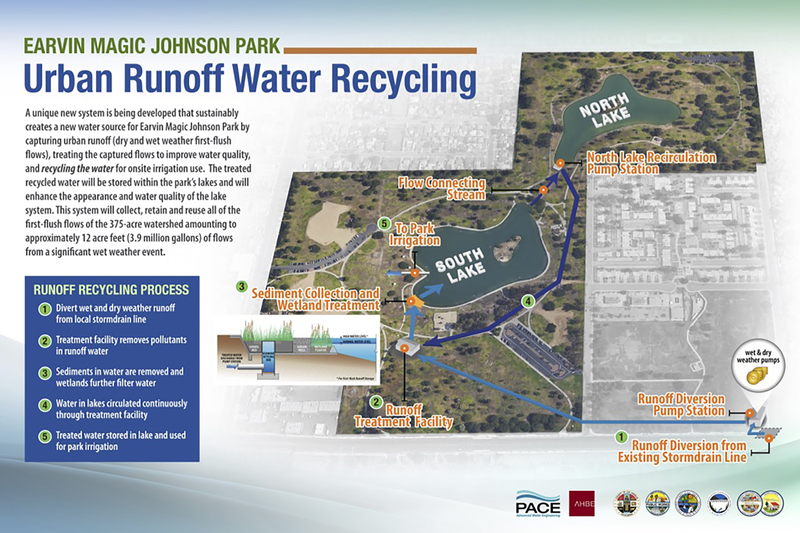 Among the new and improved park amenities, we are taking the 8-acre south lake off its current domestic water source and replacing it with treated recycled stormwater. We will then use the lake water to irrigate the remaining 120 acres of the park. Consider the following: how much more effort would it really take for the next step toward Net Zero Water at an eco-district scale? The recycled irrigation water we are generating is almost at drinking water quality now. What if we treat the lake water for drinking quality and use it to supply the neighborhood? California’s population is projected to grow to 50-60 million by 2050 and, according to the most recent climate models coming out of Lawrence Livermore Labs, the state will have 10-15% less water. We must explore options that will allow us to live, grow, and prosper with these challenges. 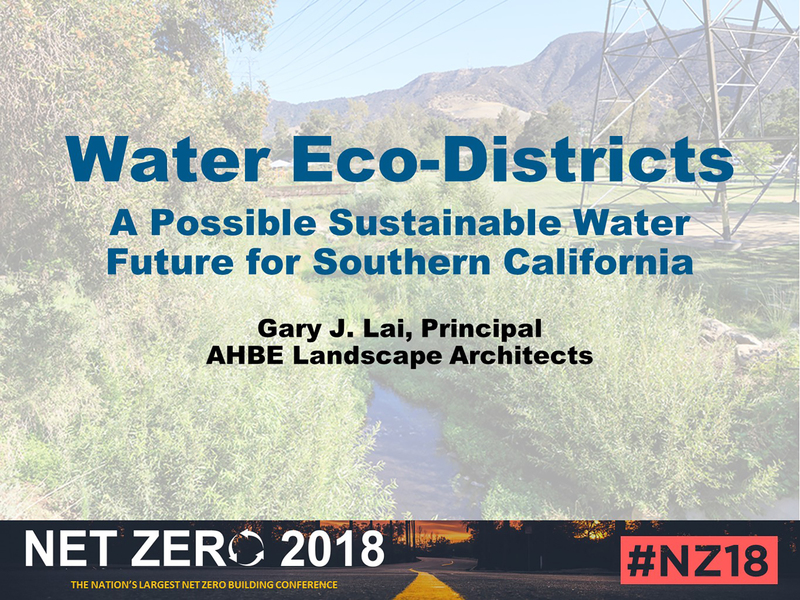 If you are interested in learning more about Net Zero Water, please join me at the 2018 Net Zero Conference on September 13. I have more to share on this subject and I look forward to meeting you at the conference. 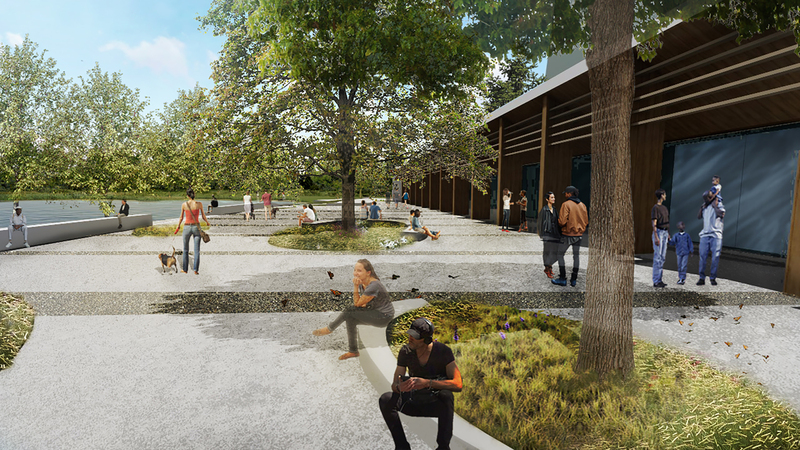 Rendering by AHBE Landscape Architects for Magic Johnson Park Phase 1A project. Aerial view of Dublin’s St Stephen’s Green, showing greenery, paths, and a pond, surrounded by buildings. Photo by Dronepicr/Wikipedia (CC BY 3.0). During an open house event for a park this weekend, I noticed a gentleman grew disinterested speaking to me while I was responding to his questions when he realized I was “just the landscaper”. Despite AHBE Landscape Architects being the lead firm responsible for designing the park, the man wanted to talk with an architect. The interaction made me realize any talk about the future of the profession of landscape architecture seems premature today, considering how little the general public or even our peers in the A/E industry, know about our profession. However, all things evolve, even landscape architecture. When landscape architects talk about the future of the profession, we are talking about how landscape architecture has been practiced and perceived over the last 150 years versus how we believe it should be practiced over the next 150 years. Traditional landscape architecture primarily concentrates on aesthetics – more specifically, the idealized English country garden aesthetic our “Father”, Frederick Law Olmsted, imported to the United States through his design of Central Park in New York City. This pastoral aesthetic has since dominated how Americans build parks, cities, and our own residences across the country. Unfortunately, in our effort to achieve this idealized vision, landscape architects have forced the aesthetic into environmentally incompatible locations. For example, in Southern California we expend a vast amount of resources to maintain a northern European-style landscape comprised of lawn grasses, herbaceous shrubs, flowering northern latitude woody plants, annuals, and bulbs. This type of landscaping requires a great deal of water, fertilizer, specialized equipment, specialized irrigation equipment and a myriad of soil amendments to install and maintain. Fast forward to 2018 and landscape architectural design has slowly evolved to take into account the amount of effort and resources necessary to maintain our landscapes. We have become more sustainable, and consequently, more deliberate and scientific in our approach to design. The future of landscape architecture will demand we use our knowledge of living systems to create environments that reduce or eliminate the use of natural resources, while still creating places of value and beauty for humankind. For example, planting a native California landscape locally naturalizes to our climate, expending a fraction of the resources required to maintain the landscape. Native plants would also be regenerative to the local environment by creating habitat for local wildlife. The challenge is getting native plants to survive in our urbanized environments, while also imagining aesthetic value for the public. For decades, landscape architects have been regarded by the A/E community as a second-tier profession that did not provide essential services for humanity (as my friend likes to say, we are “hair and makeup”). Even though we have always fought for relevancy using ideas of “nature” and “beauty” as essential elements to design, Americans in particular have always thought of buildings, bridges, and roads as more essential. In a way, the criticism carries some truth, noting landscape architects have tended to only represent nature and beauty in an idealized form, regardless of the impact to the surrounding environment. As we run out of resources and push our planet to the edges of human habitation, landscape architects must change to incorporate the natural sciences into our designs. Designing natural/living systems become an essential requirement of our profession. Of course the irony here is the dire circumstances of climate change will push landscape architects to the forefront of the design world, delivering us the legitimacy we have always craved. I recently attended the California Parks and Recreation Society (CPRS) Conference in Long Beach, and surprisingly found the educational sessions sparsely attended. That all changed with “Exploring Homelessness in Parks: Strategies for Compassion Co-existence”, a crowded session with over four times more attendees and standing room only. It was during this session I realized landscape architects and the homeless will be inextricably tied together for the foreseeable future, falling onto us to responsibly and compassionately deal with the social, health, and design issues connected with homelessness in our public parks. “Look the other way”: A “do-nothing” approach. This does nothing to help the homeless, and will chase other park users away. Regulatory: An approach concentrating solely on passing legislation to keep the homeless out of parks, including establishing “no loitering” or “no sleeping on public land” ordinances. The biggest issue with this approach is it does eliminates any flexibility. If a homeless man is found sleeping in the park, do authorities jail or fine him? Alone, the regulatory approach does nothing. Seclusion or relocation and disbursement: Law enforcement against the homeless has been used on and off since the Great Depression, simply making homelessness illegal, giving law enforcement officers the authority to arrest, harass, or relocate anyone without a home. Downtown LA’s Skid Row is an example of how LA County use to “dump” their homeless into a central location under the pretense services would be provided there. In reality, the location is completely overwhelmed, and has become the face of homelessness for LA County for the last two decades. Defensible space: Designs intended to make the homeless uncomfortable and deny them access to the public space are strategies familiar to landscape architects. One can often spot park benches with an additional armrest dividing the middle, a design intended to deter the homeless person from sleeping on it; the new Art’s District Park adjacent to the La Kretz Innovation Center is entirely fenced around its perimeter to restrict access. Besides the sticky legal ramifications of denying access to a public space, design-only solutions have proven ineffective. There is no way to make a park more uncomfortable than living on the streets of Los Angeles. Desperate people find a way to survive. Creative Commons photo by David Whittaker; (CC0). “Social Justice”: Championed by homeless rights advocates, social justice stresses compassionate intervention that attempts to steer people into shelters or interim housing, as well as public service programs. Lack of funding, shelter shortages, and the overwhelming number of homeless have stifled this strategy. “Declared Emergency”: When an outbreak of Hepatitis A killed 25 homeless in San Diego County, county officials were prompted to declare a health emergency. The emergency allowed county agencies to freeze local ordinances and regulations, and provide emergency funds to install facilities like portable toilets and hand-washing stations with 24 hour security throughout downtown San Diego. The approach proved to be very effective in the short term. The simple truth is none of the approaches above will solve homelessness by themselves. As a park professional and designer, I believe we need to treat the homeless like any other park constituent dependent upon the public space for services. This means park agencies and designers need to integrate services and programmed spaces for the homeless into new and renovated parks. Agencies also need to provide park staff with maintenance and appearance standards to use as the basis for decisions relating to their homeless constituency. This differs from the aforementioned regulatory approach because it provides options for services rather than simply outlawing the activity. At last count, Los Angeles County has 55,000 people living on its streets, 11,000 of which are children. As a result, our public parks have become the main intersection between the homeless and society at-large. Historically, public parks have always played this role, especially in Los Angeles. The great population boom of the early 1900’s led to an investment in public space, only to be “defended” from homeless families using the parks as camp grounds during the Great Depression. This last decade and the Great Recession it brought pushed homelessness from an intractable problem to crisis levels. Ironically, the economic recovery has ballooned homelessness even further, with government and private developers unable to solve mounting issues surrounding affordable housing. Even with a massive influx of funds from new tax and bond initiatives, moving 55,000 people off the street will require a generation. As park agencies and landscape architects renovate our city’s aging park infrastructure, we are tasked to consider the homeless as a major user and stakeholder in our park designs guided by the ideals of “compassionate coexistence”.